Adam Hoffman’s name isn’t as familiar as Thierry Rautureau’s, but it should be. For more than a decade at Rover’s, Hoffman worked side by side with “The Chef in the Hat.” As chef de cuisine for eight years, he ran the kitchen at that four-star French restaurant. Always a behind-the-scenes kind of guy, Hoffman, 41, got his first taste of running the show for the owners of the late Figaro Bistro in Lower Queen Anne. He was a sous chef at Mauro Golmarvi’s Assaggio in Belltown and a line cook at Peter Dow’s original Cafe Juanita in Kirkland. 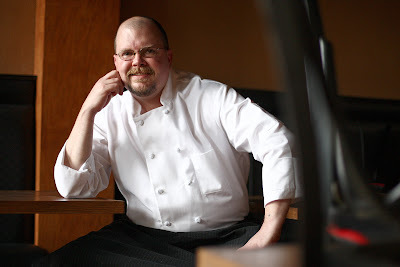 But today he’s making a name for himself: at Adam’s Northwest Bistro & Brewery in Monroe. Chef Adam Hoffman at home in his new restaurant, at 104 N. Lewis Street in Monroe. Like chefs-for-hire everywhere, Hoffman has long harbored hopes of owning a restaurant. Indeed, he’s had investors come calling, but potential deals fell through. Even Rautureau knew it was time to take the next step. “Chef told me, ‘Adam, you have a job here for the rest of your life, but you’re never going to be as happy as you can be until you get a place of your own. '” In November, he found it. Hoffman, who’s lived for years with his wife and children on Snohomish County’s Echo Lake, sees Monroe as “kind of like the small town where I grew up” in Southern California. It’s long on fast-fooderies and Mexican joints, and short on the Northwest-styled bistros. Barajas hooked him up with Tim Kovach, owner/chef of the Sailfish Grill, one of the city’s finer-dining spots, who was looking to retire from the business. Like Hoffman, Kovach had been drawn to Monroe’s small-town charms when he relocated the Sailfish from North Seattle in 1993 to the brick building at 104 N. Lewis St., adding an adjacent brewery a year later. When they met, “It was just two chefs talking,” about cooking and home brewing (for which they both had a passion). Three hours later, Hoffman said, “Hey, I’ve got to go to work” and asked, “Are you really interested in selling?” Kovach was. They shook hands. Kovach turned over the keys Feb. 1, leaving Hoffman to re-imagine the place as his own. After installing new hardwood flooring, working up his menu, hiring Sailfish Grill’s staff as his own and entertaining Rover’s Chef in the Hat and his crew Monday night, Hoffman opened Adam’s on Tuesday. He’s focusing on foods that are local and sustainable, or as he likes to say, “fresh product, perfectly cooked,” including house-made charcuterie, a 12-ounce rib-eye, handmade pastas and Northwest seafood stew. The kind of place where a kid came in off the street and helped label spices for hours, unasked, and strangers stop by to see what’s in store and end up sampling slow-roasted chicken hot out of the chef’s new applewood-fired smoker oven. “A lady came in and said, ‘I have a farm up the street and raise chicken and ducks for eggs.” She’s now among the local foragers and cheese makers whose wares might be found at Adam’s. Adam’s is open nightly, 4-10 p.m. Reservations: 360-794-4056.